Map showing the location of Celtic Park in Scotland. Genuinely fantastic atmosphere. Would urge anyone to sample it, even just once. I would suggest you ignore the comments of 'Simon Cartwright' (not his real name). Just another example of the petty jealousy we have to endure from younger Glasgow clubs. Very cheaply built stadium which is in a state of disrepair. It needs a lot of work done to it. Celtic Park is the best football stadium in Scotland. With a 60,000 capacity it has 10,000 more seats than Ibrox. The curved corners give it an enclosed feel instead of four separate stands which is superior to other grounds who's owners have tried and failed to fill in the corners. The crowd are fairly close to the pitch unlike Hampden which has a running track which arcs the fans away from the pitch behind the goals. Celtic's stands tower high above the grass and provide a very intimidating atmosphere, especially on European nights and matches against local rivals. There is a safe standing zone in one of the corners where a singing section provide huge vocal support and colourful displays which are the envy of many other clubs. 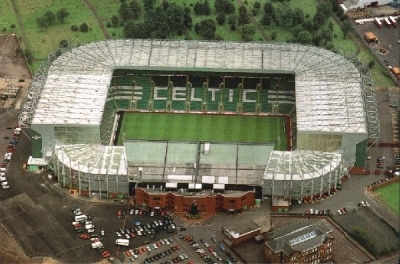 Built for a cost of £35Million in the mid 90s, Celtic Park has proved to be outstanding value for money for the club. The approaches to the ground look tremendous, especially the Celtic Way leading to the front door and the statues and banners on the outside of the stadium add a touch of class. Nice stadium, but feels and looks like it was built on the cheap and obviously not to last. Still two excellent stadiums in Glasgow. Pity Ibrox is crumbling! You have the ability to request en edit to any of the details of Celtic Park. You can do this by clicking on one of the options below.